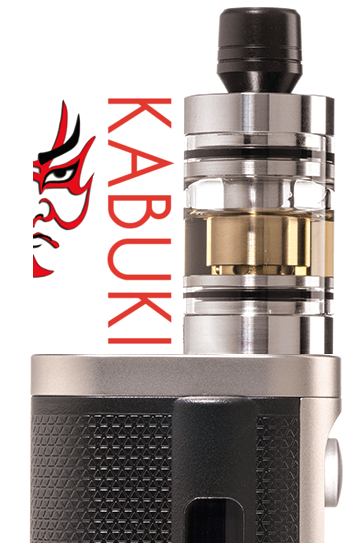 The Kabuki Tank is the #1 selling MTL tank IN THE WORLD... Convenience and flavor... Unsurpassed performance. The sophisticated vaper isn't going to be bothered by the day to day grind of coiling an atomizer, the mess of dripping... the inconsistency of it all. No... vaping isn't supposed to be hard work... it's a pursuit of pleasure... an exploration of enjoyment. But these days, there is a clear cut line between the artistry of the high-end hand assembled atomizers, and cheaper imports with drop-in coils... there is a need in the marketplace for higher-end tank systems that use commonly available replaceable coils. There are no cheaply made stamped out parts... this is pure high-end vaping. And we've done away with that clumsy airflow ring that is never in the right position, or get's bumped away from the optimum setting... a simple set screw is adjusted when you first setup the tank and you'll ALWAYS have the perfect draw. Never again will you have to deal with it being clicked into the wrong position after filling or storage in your pocket. It looks like a quality device... because it IS! Does it make sense to use a cheaply made 39 dollar tank on your high quality PV? Until now, your choices have been high-end rebuildables or low-end drop-in coil tanks. You'll be amazed at the difference... and forget about how you "think" a drop in coil performs... our air-flow system maximizes the flavor of your favorite juices, focusing even the most subtle flavor notes for a more pleasurable, sense fulfilling vaping experience that must be tried to believe. The Kabuki Tank is available in a variety of connector styles... The traditional 510, as well as HoH Z2 and the ProVape P3 connections are available so you can fully experience the added benefit of the industries most sophisticated equipment. Kabuki Tank is available through any of our retailers and will soon be in distribution throughout the world, Ask your local dealer to get them in stock. If you feel you deserve the very best, you owe it to yourself to give this tank a try! Best tank yet! You'll love this tank if you are a nautilus fan. The flavor is much better, airflow is 10x better, and no leaks yet. I have the airflow screw in half way in and it still rips like a champ. I really like this tank (built like one too). Quality construction and I have never had performance this good with a prebuilt coil. I hope Zen will offer a 5ml tank. This is a winner! Perfection! After going through different Kanger Tanks (Pro- Aero and Subtanks), trying out the Eleaf Lemo and sticking with the Nautilus/Nautilus Mini for a while, I can now finally say: This is the Tank I have been waiting for! It's just perfect! I'm not into RBAs as fiddling around with coils and cotton is not my thing. So i stuck to the Aspire Nautilus/Nautilus Mini for a long time and was more or less happy with the flavor. But I was a bit annoyed by the occasional gurgling and the build quality which is not that good (I even had one that startet to rust under the base silicone ring) and that you never really get the flavor from a liquid out of the silicone rings which can be a bit irritating when switching flavors. Enter the Kabuki 510 from House of Hybrids: I can still use the Aspire Nautilus BVC coils but now I have a tank that never gurgles, provides a better taste than the Nautilus and is easy to use, to refill and after cleaning there is no flavor ghosting. On top of that it's sturdy and has a great size to carry it everywhere. I use it on a blue Coolfire IV and it just looks perfect. A friend of mine who uses a Squape tried my Kabuki and was blown away by the richness of flavor from a prebuilt coild. The only gripe I have is that if the glass ever breaks I will have a hard time finding spare parts as HoH does not deliver to Switzerland (at least not yet). One minor thing: It took me a while to get used to the feel and size of the drip tip as I use mostly narrower ceramic drip tips. But after testing around with severeal glass, steel, ceramic and POM drip tips I have to say that HoH nailed it with the drip tip they provide with the Kabuki. It truly delivers the best flavor. I ordered a second Kabuki today because I'm that happy with it. And I might even buy a third one once my last Nautilus dies :) Yes, the price is high but it's worth every penny and comes with lifetime warranty. It's too bad I can't sleep and vape the Kabuki at the same time! I don't know how. I don't know why. But I sure as hell know this tank destroys $150+ thanks in my collection in the flavor department. After reading reviews I decided to get the Kabuki P3 tank. I have been enjoying a higher level of vaping - an awesome tank! As it uses Nautilus atomizers, I expected the same response - but the Kabuki is so much better. More vape, more flavor and no lingering taste from previous fluids when I change. Love it! I am in awe...I honestly did not believe that just a tank would make such a difference, but I was wrong. This tank is awesome! Aside from looking great on my p3, which I love as well, this tank has improved my vaping experience, taking my p3 to a new level. It is extremely easy to install and adjust, and the airflow beats any other tank I've ever used. It really brings the flavor of my juices to life. I can't imagine going back to my old tank. It's great that is uses the aspire nautilus coils, so no need to order more expensive coils. I truly can't say enough about this tank. The power of the inhale, and the clouds emitted from the exhale compare to my sons very expensive box mod, which is outstanding considering this is all just from changing a tank. Worth every penny. Definitely impressed. I was blown away by this atomizer...can't believe it gives RBA performance with an Aspire coil. Solid precision build...only complaint is a small tank, but it performs so well, I'll just carry extra juice! It’s Perfect!... For several years I've used the Z-Atty-Pro on my Provari. Bit the bullet and ordered the Provari P3 and the Kubuki. Honestly, the Kabuki in comparison exceeded my expectations. Exudes quality and looks fantastic. The Kabuki's drip mouthpiece design is a masterpiece, nice to use and eliminates my worries of chipping a tooth. Gone are those days of wiring a wick and filling is easy. I'm glad I purchased a Kabuki and know you will be too. Better flavor, easy to use, Super smooth threads!... My first impression of this Kabuki was how nice the machining was, and how clean it arrived. Fit and finish are perfect. A quick rinse was all it needed as there was no residual cutting oil typical of so many imported atomizers. The airflow adjustment works great, with only one moving part, and it stays where you want it. Flavor really shines through with this atomizer! I noticed a remarkable difference between the Kabuki and the Nautilus. Another note is that I turn the voltage down about .2volts from where I like the Nautilus tank, Better conductivity is achieved with the direct contact of the coil pin vs. the Nautilus base. 3ml capacity is a perfect match for my Ti ProVari in 18350 mode, I love this atomizer! Thanks Provape! Thanks Zen! Wow! Worth every penny… I was hesitant at first due to the cost, but with my rewards I bit the bullet. Just came in today and I am SO impressed. It has the convenience of an nautilus with the air flow and flavor of a RDA. I loaded it up with a juice that I had in my P3 nautilus and set my air flow. (Love the airflow adjustment) WOW!!! The juice tastes so much better. It's pricey... But hey... You get what you pay for. On a final note: it holds less then a nautilus but I think I like it better because it gives the P3 in 18650 mode a shorter profile. Fast shipping and great packaging. Awesome tank... This is it for me, finally found tank that is simple to take apart and wash when changing favors. Flavor is amazing, no leaking and I'm vaping on 8 watts with 1.8 ohm coil on P3 with 100% VG compared to Nautilus tank on 10 watts and 100% VG. Nautilus would always leak and overflow, this tank has no issues with thick e juices. This baby produces more warm vapor with rich flavor on lower watt settings. Make sure you wash it before first use, I was to eagar to try it and did not wash it before first use and residue oils from manufacturing gave very bad taste to the liquid. Great atomizer... Don’t let the cost fool you. This is a vape that I've had from similar tanks/atomizers that cost over 200$. The tank is made out of 316 SS(superior to all other kayfun minus the v4). The vape is really good. A lot better than a stock nautilus. This tank is being requested by juice makers all over because of its flavor. Its truly a great tank. Dont let that idiot vapor joe fool you! He's just out for hits on his site. This tank is worth every penny. Lifetime warranty on all parts except glass and coil. Free atty base with the tank. You cannot go wrong! Awesome and easy... This tank gives off amazing flavor compared to the nautilus tank. Uses the same screw in coil for an easy, no fuss vape. I have one on a ZNA and one on a istick 50. Great fit for both devices. One of my favorite features is the material its made from. 316L (surgical stainless steal). Thats means no worries of leaching from chrome plated brass or the cheapo stainless most of these other 30 and 40 dollar tanks on the market are made from. Need at least one more tank for that third juice rotation. Comes with an atty stand in the packaging and with a lifetime warranty, how can you go wrong? Anyways, I love this tank and will recommend it to ANYONE! Amazing Flavor! After vaping for 5+ years, and trying just about every tank on the market, I have finally found my "happy place"! The Kabuki tank has all the convenience of a drop in coil, with flavor that is amazing. Quality materials, lifetime warranty, and american made, what more could you ask for? Sure, it costs a little more than some tanks, but you definitely get what you pay for and besides, if you are going to be using a high quality (high $$) mod, don't you want a tank that is just as good? I own three of these and love them!!!! The "Rolex" of tanks... I spent a LOT of money back in 1974 for a Rolex watch...and I've worn it every day since then. I've had to clean it, get it tuned up and replace the glass...just normal wear and tear. A friend told me "I could buy 100 Timex watches for what you paid! I suppose so...but, for the last 42 years, I haven't NEEDED to buy another watch...this one is doing fine! I thought about buying a new one a few months ago...and the jeweler offered me just a bit more money (today's dollars) than I paid for the watch (1972 dollars). When I started Vaping five years ago, I spent WAY too much money buying things that DIDNT work! Instead of taking my own sage advice and buying QUALITY mods and tanks! Well, I got wise a few years ago...and started buying "the Cadillac of Mods"...and I started buying more expensive (and beautiful) tanks! I understand that $80 +/- is "a lot" of money...but, FIRST, this is a QUALITY device! Second...to those who say "Gee, ARENT you going to offer this at a REASONABLE PRICE?" I have a question...how much were you paying for a pack of cigarettes before you started vaping? A pack over at the Stop-n-Rob was 6.75 plus tax...close to eight dollars...and I smoked about a pack and a half a day...so, about $12 a day for STINKEY CIGARETTES...and all I was left with was stinkey butts every day, holes in my clothes, gum disease, a stinkey car, COPD....need I continue? This beautiful tank costs a little more than a carton of cigarettes...and it is certainly better for you than that carton EVER WAS! I really loved my first one (with the P-base, so, I not only loved the blue color, but wanted a 510 connection...so, I'm here to get a second one...I'm not upset with the price...sure, it would be nice if it were cheaper...but, it isn't...and I want it! I was somehow able to buy SIX CARTONS on cigarettes every month, back when I smoked! Even going to Costco, where a carton was $55, that was OVER $330 a MONTH! I spend about $50-65 a month on ejuice, about $22 on replacement coils...so, that leaves me $200 a month saved...there's no reason that I can't let myself buy a quality mod or tank occasionally to treat myself...I deserve it (and so do you!). You will love this tank! The folks at Zen are right...I want a quality tank that I don't gave to "fiddle" with! Just replace the coil and Vape on! The Kabuki tank is a good vape really flavorfull, the only problem i have with it is the glass, don't screw it down all the way it can chip or break the glass the tank is functional and sealed when the glass is over the o-rings, currently i have two of these tanks and love them both. Best Flavor tank on the market... By far, this is the BEST tank on the market if you truly want to taste your E-liquid. (oh and yes, you can cloud up the room too if you wish) Backed with a lifetime warranty (glass, o-rings and coil exempt of course), made in the U.S.A. by a well known manufacturer (House of Hybrids), uses a widely popular replaceable coil, and comes with a free stand that holds the allen wrenches, you cant go wrong. i have 2 of these and plan on buying more. Simply Perfect... If you can afford it buy it, If you cant afford it save up and buy it ;). what can i say if you want a no leak trouble free set it and forget it piece of Americana craftsmanship you cant go wrong with the KABUKI 510. Awesome… I love this tank . In not a builder so I've been waiting for the ultimate tank experience and this is it . Ya it's spendy but well worth it . Some people spend $150 on a rebuildable , so whatever . My money. The only knock is the drip tip , feels really weak , but no biggie I bought it for the tank and it works! Kabuki 510 is Awesome! I have been using the Aspire Nautilus mini since it was first released. Since then I have tried the Aspire Atlantis as well as the Kanger subtanks only to be disappointed with the flavor based on my taste . I have several Kayfun Lite+ and some drippers and find that I really like the convenience of the Nautilus over building plus I find the flavor from the Nautilus pretty close to being as good as if not better IMO. When I came across the Kabuki 510 with features like better flavor production and almost endless air flow adjustment I just had to try it. I am extremely pleased with the Kabuki so much so that I have ordered again. And BTW if you are currently using the Nautilus you will definitely like the air flow — adjust it once to you liking and that is it — a hundred times better than the AFC that comes with the Nautilus IMO. I am so happy HoH designed the Kabuki for the Nautilus BVC coil heads. Worth it! Airflow adjustment works well, wicking is great, best flavour I've had from any drop in coil device. Great to see a device made that can compliment a high end mod. Only gripe I have is the drip tip. Why on earth Zen would ship a cheap plastic drip tip with a high end 316SS device like this is beyond me. Not at all the same quality as his tower drip tips. The device itself though is worth the money. Great little device, performs well and of good quality. Quite a bit shorter than the Z2 Z-Atty, good for when I want things more compact. I love the adjustable draw setup on it, haven't had to touch it once I got it set how I like. My only complaint is I have to refill it way to often with it's small tank. Great kabuki!!!! This is just a beautiful tank flawless construction. The airflow control works just as promised. This is my favorite device now. I just can't believe that it uses nautilus coils it produces great flavor and vapor. I let my friends try it and they thought it was a rebuildable atty. they were very surprised to find out it had a aspire coil in it. Thanks mike for another great product. Thanks electronicstix for selling mikes devices. I just received my Kabuki P3 tank from Provari. My Nautilus P3 broke and Nautilus is not making them. I was a bit skeptical about changing but now I am so glad my Nautilus broke (after 3 months)! Much cleaner taste and bigger clouds! Absolutely to my liking! Using my Kabuki tank for the first time was like getting behind the wheel of a Cadillac after a lifetime of driving a Ford Taurus! LOL I am just so in love with the vaping experience I get from the Kabuki. I'm still struck by the impression that I'm using a very well-built precision piece of equipment. Kudos to you and thank you so much! I've been vaping about 4 years. I've tried the nautilus and it was good but the flavor was so-so and coils didn't last too long. I heard about this tank and wasn't convinced it would really improve on the design. I figured it was worth a shot and gave it a go. I am VERY impressed with the flavor and vapor output. It's really good. If you're on the fence because it's $90, do yourself a favor and give it a chance, you won't be disappointed. Have had my P3 version for a week or so and simply love it! The flavor puts everything else I own to shame. Best tank ever and I have quite a few high end rebuildable tanks in my arsenal, I haven't used any of them since I received the Kabuki. Easy on Juice, Superb flavor, and easy coil swaps, you really can't beat it. I hope this atty is a success for HOH, its excellent.